Photograph courtesy of Andreas Trepte Visit Photo-Natur. Epidaurus is one of the most well known archaeological sites of Greece. It was a sanctuary dedicated to the god-physician Asclepius,and was the most famous healing centre of the Greek and later the Roman world. 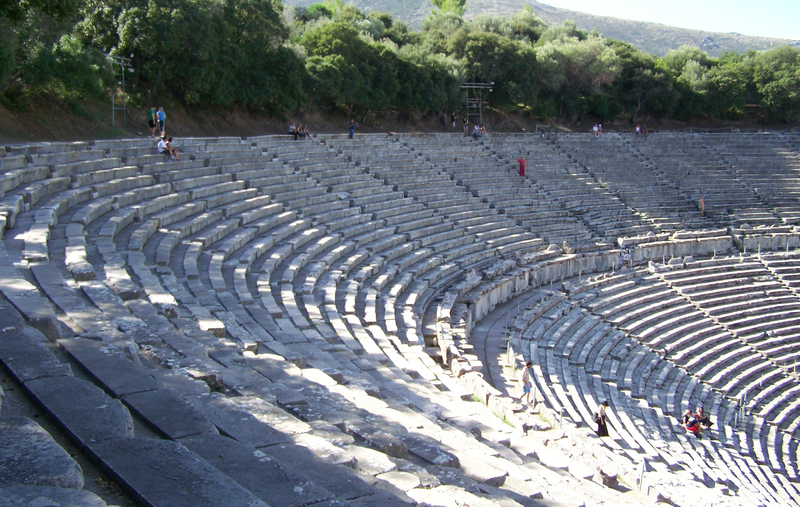 Epidaurus is considered to be the birthplace of medicine and there are many spas in the area. The area was devoted to the cult of several healing deities since prehistory. A Mycenaean sanctuary on the Kynortion hill was dedicated to a healing goddess from the 6th c. BC, built over the remains of a settlement from the Early and Middle Bronze Age (2800-1800 BC). It was unusually large and offered its services until the 11th c. BC. This early sanctuary was replaced in 800 BC by another dedicated to Apollo, (also a healer) worshipped here as Apollo Maleatas. 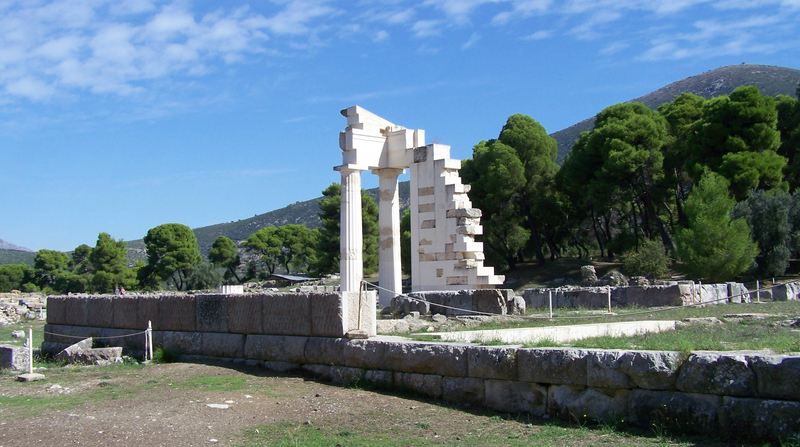 The worship of Asclepius, the sanctuary's main healing god, traditionally though to be the son of Apollo and Koronis, granddaughter of Malos, king of Epidaurus, was established in the sixth century BC. Asklepius was a very popular god with an ever-growing number of worshippers. The sanctuary at Kynortion was very soon to small for the number of visitors, so a new sanctuary was founded in the plain, approximately one kilometre northwest of Kynortion Hill, on the site where, according to the myth, Asclepius was born. 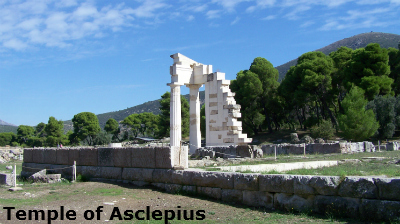 Asclepius also had a small temple dedicated to him, built in the Doric style. 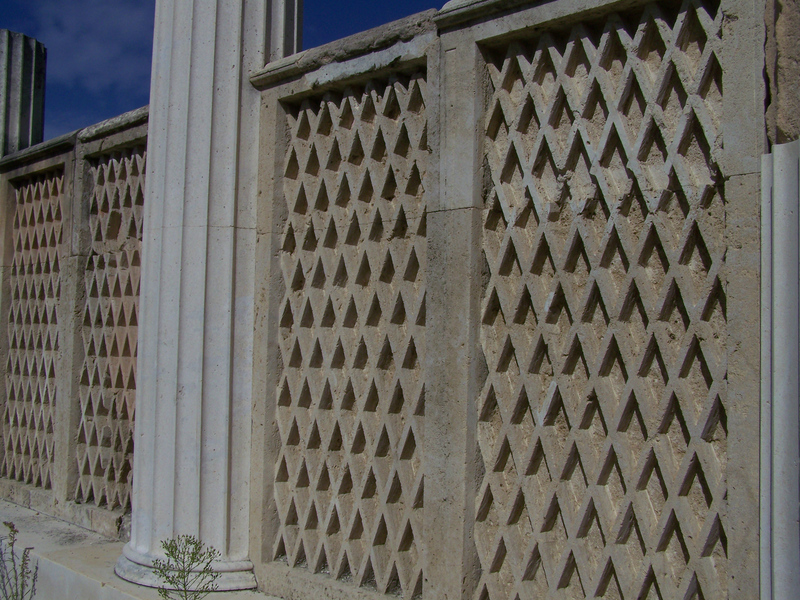 One corner of it has been renovated , with only some of the original pieces being used. A statue of Asclepius made of gold and ivory, sitting on a throne with his left hand on the head of a snake, once stood inside the temple. A Tholos, or round temple, designed as a mausoleum for Asclepius, was built in the 4century BC by the architect Polykleitos the Younger. In the 4th and 3rd centuries BC war led more people to seek for help from Asclepius making the sanctuary one of the wealthiest of its time. 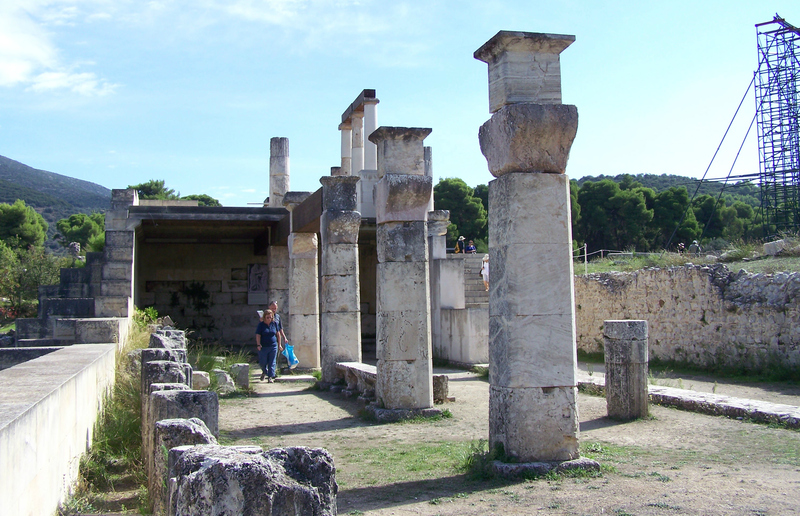 This is when important buildings were erected, the Classic temple, the altar of Apollo, the Great Stoa, the residence of the priests and the Shrine of the Muses, the temple of Asclepius, the Abaton, the Tholos, the Theatre, the Stadium, the Banqueting Hall and the Hostel. 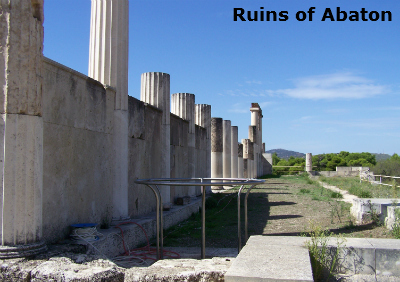 North of the tholos are the foundations of the Abaton, which has been partially restored. This was the dormitory with 160 guestrooms where the patients slept, hoping that Aslepius would appear to them in dreams and heal them, this has also been partly rebuilt. There are also mineral springs in the vicinity which may have been used in healing. The stadium was built in the 5th century BC, and used the natural contours of the ground. The start and finishing lines are still to be seen. Although the stadium had some stone seats, these were only for the judges and important dignitaries as the ordinary people had to stand. 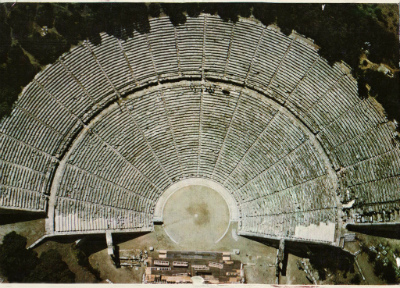 Epidaurus theatre was designed by Polykleitos the Younger in the 4th century BC,(he also designed the tholos). It is considered one of the best preserved ancient theatres in the world. In front of the theatre is the central circular area, or orchestra where the chorus performed. 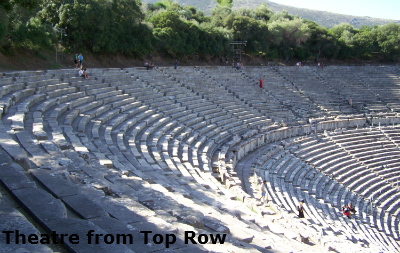 The original 34 rows of the theatre were extended in Roman times by another 21 rows, seating a total of 15,000 spectators. The theatre is renowned for its acoustics which allows almost perfect hearing from all the spectators regardless of where they sit. It is said that you can hear a pin drop from the very top of the theatre. 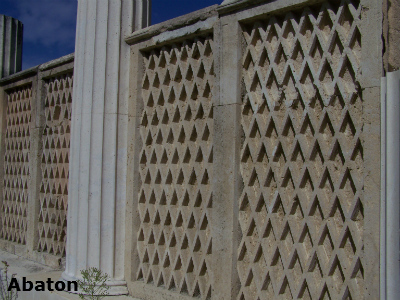 Studies have shown that the astonishing acoustics are the result of an advanced design system: the rows of limestone seats filter out low frequency sounds (such as the noise from the spectators) and amplify high frequency sounds from the stage. Between the stage buildings and the supporting walls of the theatre seats are two impressive gateways. On the far side of the orchestra were the stage buildings, including a raised area where the actors performed known as the proscenium. 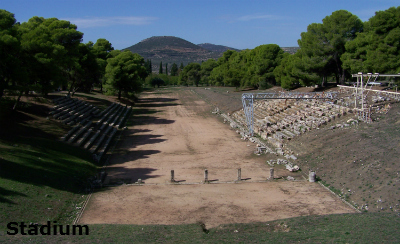 It is usual for Greek theatres for a landscape view to be seen behind the proscenium as a part of the theatre itself. 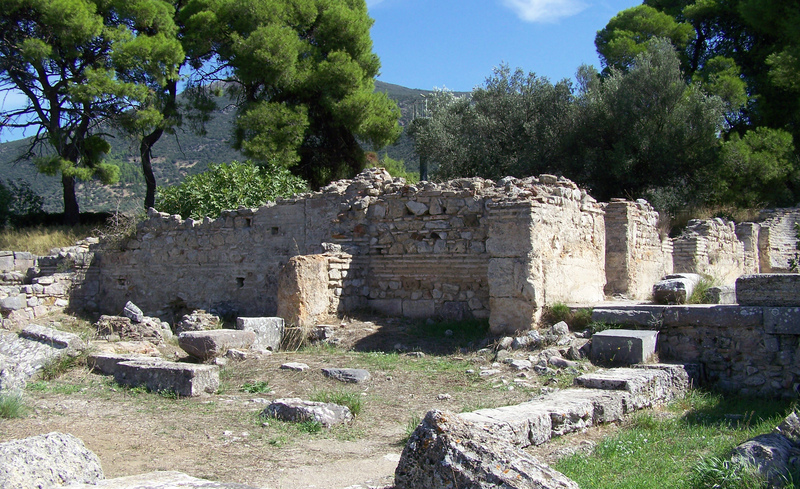 In the late 19th century, archaeologists excavated the sanctuary of Asklepios and the Ancient Theatre. The theatre was then restored between 1954 and 1963 so that it could be used for the production of both ancient and modern productions. 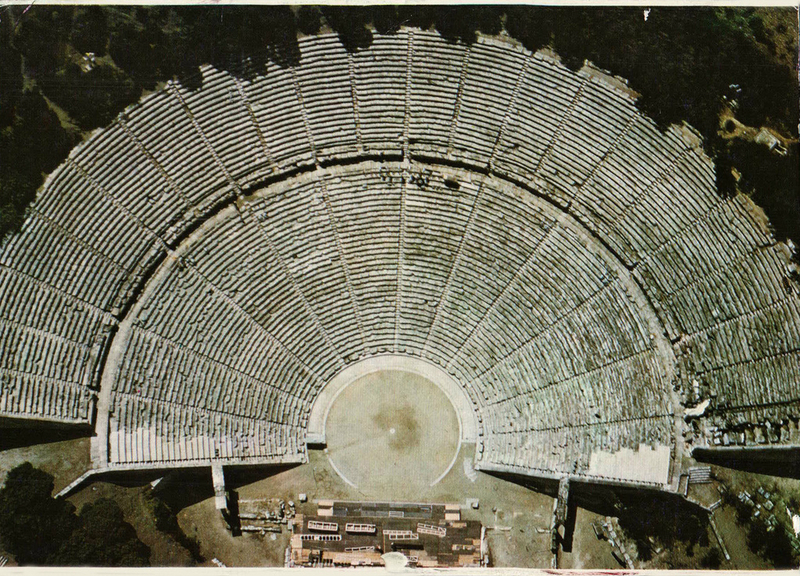 Many famous actors and singers have performed here including the famous Greek soprano Maria Callas. When you first walk around the corner and see the Theatre for the first time, it is the sheer size of it which is amazing. 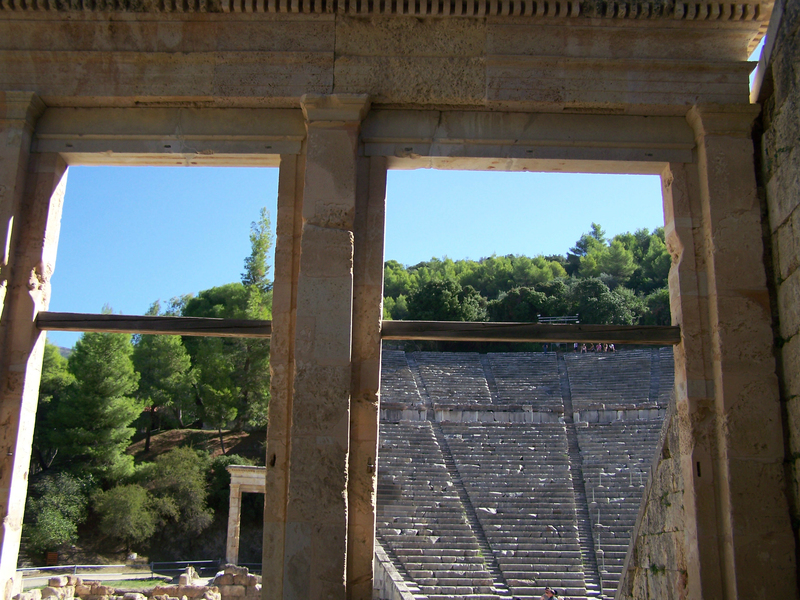 Then when you take time to climb to the top seats and sit down to look at the theatre itself and the wonderful views around, you realise the achievements and engineering ability of the Ancient Greeks. 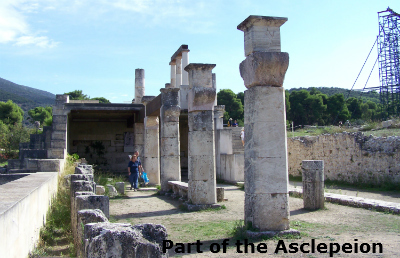 The museum is located in the archaeological site of the sanctuary of Asclepius and has many items that were found during the excavations. 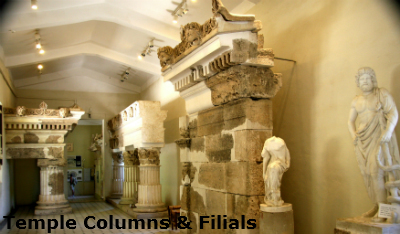 It hosts architectural parts from the temple and the buildings of the shrine, as well as columns and pedestals, altars, bronze medical equipment, votive offerings and tablets, representations of the Asclepius temple (4th century BC), and sections of the Tholos. 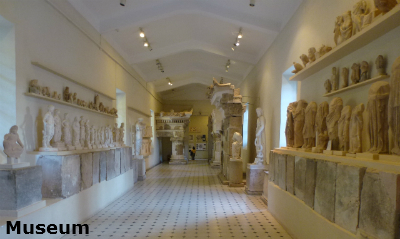 The museum was built by P. Kavadias during 1902-1909. More wings were constructed in time to house the sculptures, the pottery and other artifacts that were excavated from the site. 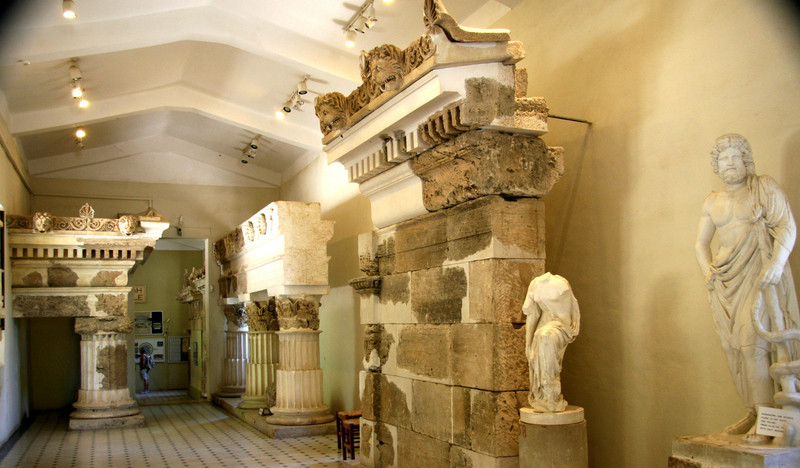 The museum is divided into three rooms, the first one has a huge collection of ancient medical instruments, related to the sanctuary of Asclepius which have been found during excavations. 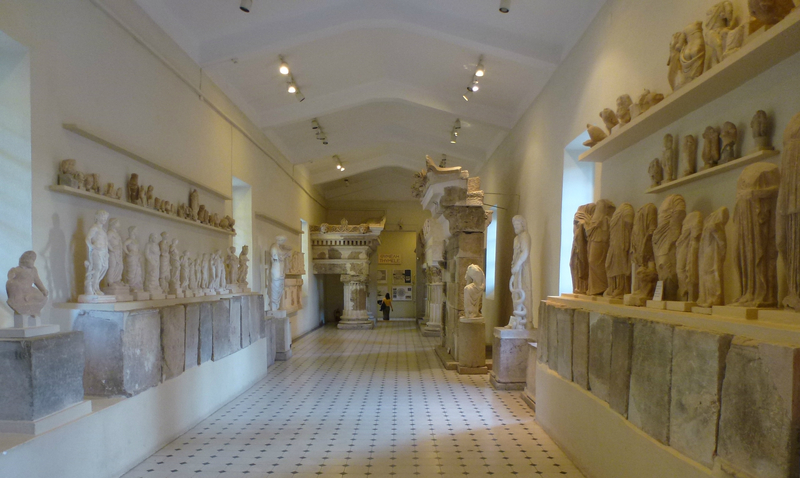 The second room is filled with statues and columns from the sanctuary with the third showing some temple parts along with some ceramics, pottery and other small items. A visit to Epidaurus is a wonderful experience, especially seeing the Theatre, and a visit to Ancient Epidaurus, the old town, (there is also a new one), is very nice as it is built along a harbour. You can also drive around the bay and look across at the town and the views from the top of the hill as you drive away are fantastic. It is also possible to drive along the coast and eventually arrive at the village of Galatas. Here you can leave your car and get on a little ferry boat for 1 euro which takes you across to the Island of Poros. Beautiful. I used Nafplio as a base for visiting sites in the area, (lots of them) and Epidaurus is only about 35 to 40 minutes away.